Often we are asked about pain in pets from our clients and how they should handle it. This is a very tough situation as there are minimal signs that we can use as a standard. Unfortunately, pets and humans do not have a universal language. It simply comes down to making the best educated guess. Of course, there are some signs that suggest specific pain. Limping may indicate an injury or joint pain and difficulty chewing or eating may indicate dental pain. Snapping and yelping upon touch in specific areas may indicate a trauma. Here’s the REAL question that we should all ask ourselves… are the prescribed pain medications appropriate or even the solution? Most pet owners rely solely on their veterinarian’s advice. In some situations this is a necessity, however the type of criteria veterinarians use to evaluate the pain and the prescribed remedy should always be questioned. In most cases, pharmaceutical drugs are very often recommended for joint issues, post-medical procedures, accidents, injuries or even cancer. This can result in masking the pain, creating unnecessary side effects and other health challenges. This type of regimen does not address the most important issue here and that is the SOURCE of the pain. Of course there are many health challenges in pets that will bring on symptoms of pain. However, we must all ask ourselves if the drugs being prescribed are really necessary and also if they contribute to the healing process? Are they masking pain and enabling the pet to continue normal activities without allowing the healing process? 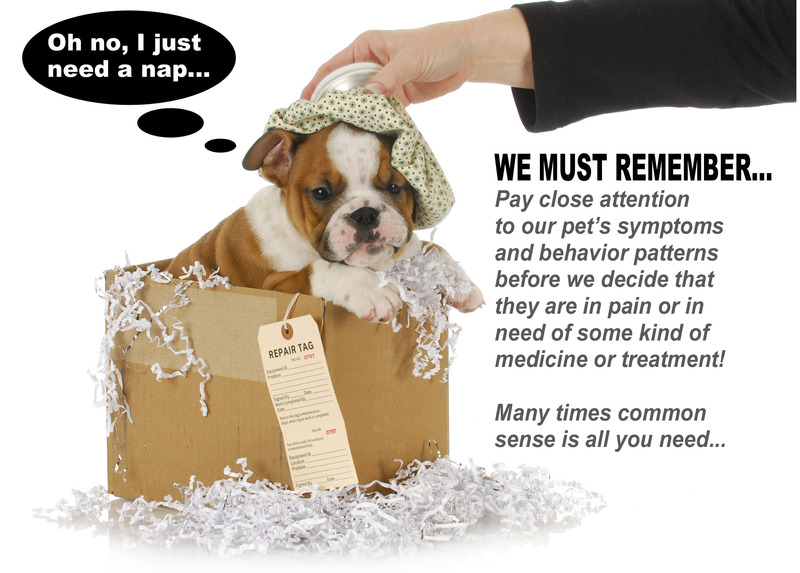 Ultimately, the goal should be to assist recovery of our pet to a healthy state and not just mask a symptom. Unfortunately, many veterinarians focus on the symptom and not the underlying cause, therefore we see little long lasting healing. We unfortunately see many pets that have been prescribed pain medications on a chronic basis which often have lead to other health challenges such as liver and kidney issues. Many medications for pain inhibit true healing by their design and also trick the body into stressing the injured area more so because of no pain. A good example is injured athletes being administered pain moderating medications and resuming the same activity only to further the injury or damage. This happens frequently in pets as well. Can your veterinarian track the damage? Duration of this treatment should also be addressed. In reality, pain medications, like all pharmaceuticals should be limited in their use and duration. The body is designed to heal itself, to regenerate and it is our responsibly to provide it with the tools it needs. Thus, a proper diet of species appropriate foods, herbs and botanicals will promote the body’s healing powers in a most natural way. YOUR pet’s body requires food to build the immune system, promote proper growth of cells and tissue, detoxify and cleanse in order to prevent further damage. The ultimate solution may not be as complex as what your veterinarian may propose but may be as simple as reaching out to other alternatives to determine the source and treatment without the quick solution of drugs. Pet Parents may not be trained professionals but are the most familiar with their pets. Use common sense, observe and jot down events to supply vital information for a proper assessment. You will realize that even the strong and mighty pet health professional may need a little help and guidance from some other source…it’s time to take charge of your pet’s health and well-being. Next time you are faced with a pet in pain and a pharmaceutical drug is prescribed, be sure to ask yourself…does my pet REALLY need this?? When you keep natural functions in mind, your pets will stay healthy and balanced through all the seasons. ← Do You Think Giardia, Worms, Heartworm, & Intestinal Parasites Can Be A Human Threat?